The concealed sliding system is more and more used in modern environments. The concealed doors “flushed with the wall” are different from the traditional ones because they do not have external frames and they are more modern and of design when it comes to aesthetics. This concealed door is particularly suitable for small environments, where the space is fundamental and necessary. 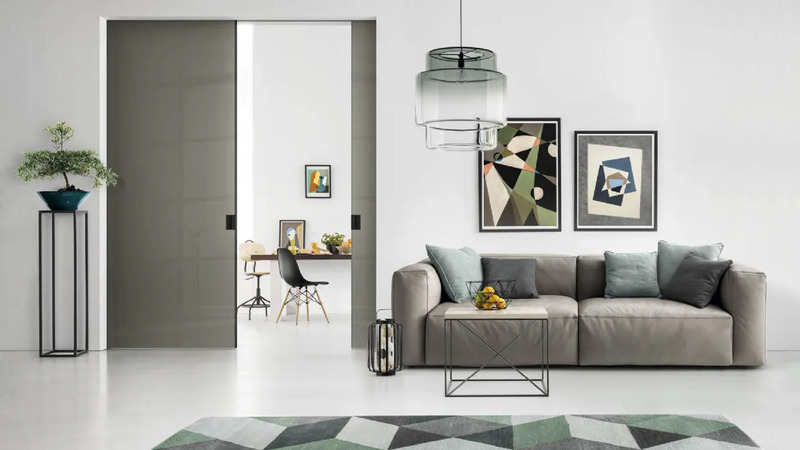 Find out the 5 best suggestions to divide the day area, such as living room from kitchen, using the right door types, profiles for the doors, colours and finishes for the glass and the use of doors for walk-in wardrobes. Do you want to find out where to make the best use of the concealed sliding door that make you save space and cancel out the total size of the door? We are here available to help you. Read the article. Time-S is a concealed sliding flush door with 40 mm thick frame and can be required with various finishes. It can also be tailored for set environments. These doors produce an effect of great lightness and strictness disappearing completely in the wall that hosts it. The doors flushed with the wall can be requested of wood, glass or glass with frame in aluminium. This concealed sliding system has the advantage of defining with maximum lightness the passage from an environment to the other. The absence of jambs, that are normally present in the traditional cases, makes this product minimalist and of design. The available doors with this system have an aluminium structure unified with a panel or glass and can be applicated on various brands of existing subframes. The concealed doors for flushed subframes of Doal can be adapted to almost every type of brands that are installed in the environments, the models Time-S, Tao and Wood. One of the main features of the concealed sliding doors is the functionality, since it uses at best the available spaces inside the walls. The principal advantage of these doors is that they completely disappear inside the wall, leaving the passage free from obstacles. Using at best small spaces and using a glass that enlightens the room are the maximum aspirations of a door and of environments where you need privacy and at the same time luminosity. They are particularly suitable for small spaces and niche environments. The supply can be made on specific request. The concealed flushed doors can be required also with peculiar decorations that can be applicated on the transparent, satinised, lacquered or reflecting glass. Doal supplies different types of decorations that furnish with extreme personality every habitat. For the most demanding ones, it is possible to execute every kind of drawing or personalised logo as wish. This type of product is often associated with the wooden honeycomb doors because they are ideal to camouflage with the walls. Doal proposes this product called Wood and another one realised in aluminium and glass from the minimalist design that can perfectly match the flushed subframes, making the surrounding environments very luminous. This feature is not present in the doors with flushed subframe of wood.